Enter your coupon messages and click "update". Stuck for ideas? See our message ideas for inspiration. The coupons print 6 per page and are numbered. You can choose the coupon numbers from the dropdown menu. 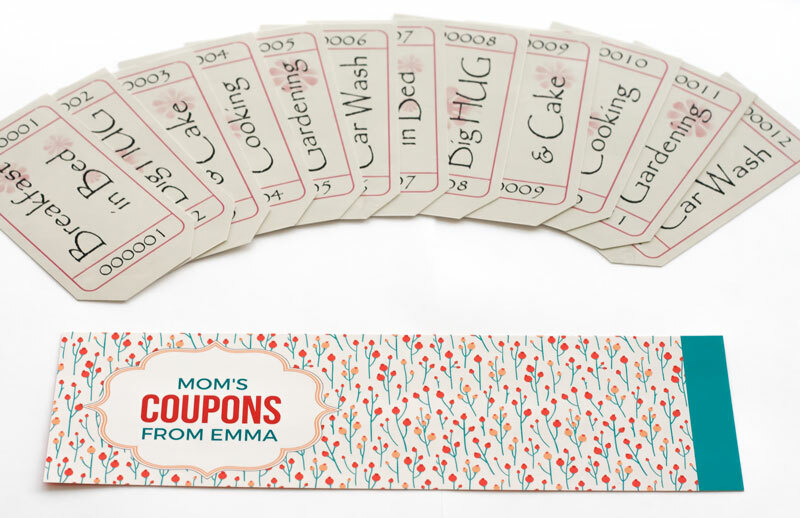 A good number of coupons to put in the booklet is 12, but the numbers go up to 18 in case you would like more. 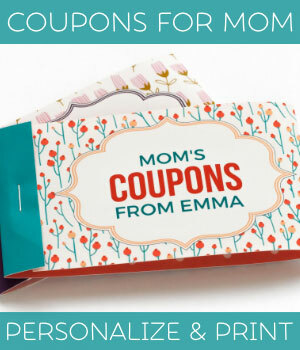 Print out your personalized coupon sheet and cut out each individual coupon. Print out the matching coupon booklet cover onto heavy-weight paper or card if you have it, and be sure to print it out double-sided. If your printer doesn't print double-sided automatically, select to print page 1 and then turn over the printed sheet and print side 2 on the other side. Fold back the colored section at the end of the cover. 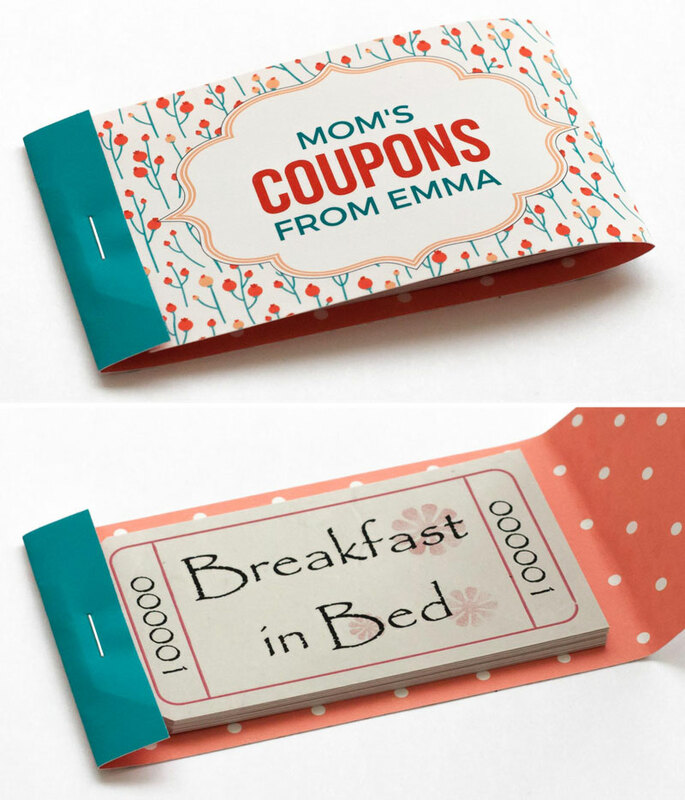 Now turn the cover over and place your coupons under the little flap. Staple to secure the coupons in place. Take the other end of the cover and tuck it in under the flap too, pressing down to flatten it in place. 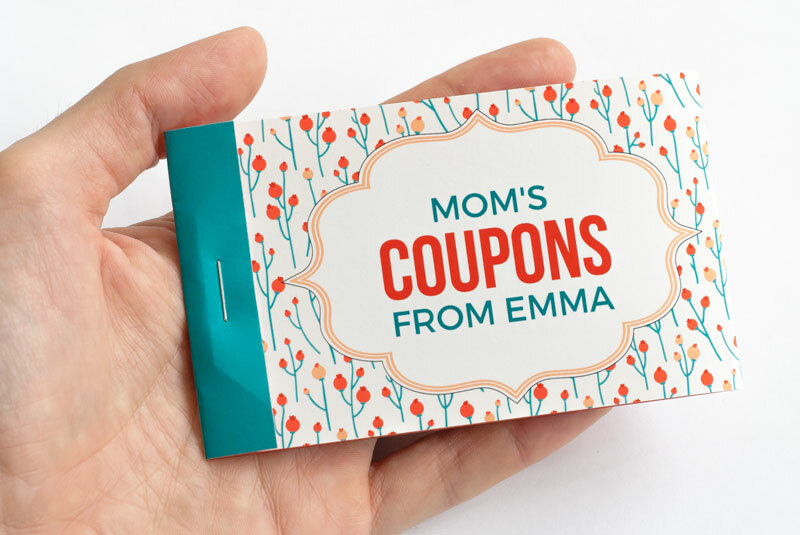 We know you want to give your Mom something really gorgeous, so we've crafted two beautiful Mothers Day Coupon booklet designs for you to choose from. 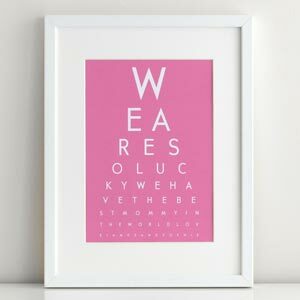 Both designs are included in your purchase. Red blossom and aqua accents on the cover, and a coral polka dot motif on the inside cover. Lilac tulips and purple accents on the cover, and a soft pink polka dot motif on the inside cover. 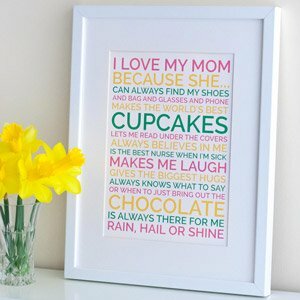 Based on feedback from you our readers we've increased the size of the Mothers Day coupons to 4.6 x 2.5 inches. This is a comfortable size to hold in your hand and it just "feels right". Your coupons are produced as hi-resolution PDF files with 300 dpi quality (finer than your eye can discern), so that your coupon booklet will print beautifully. 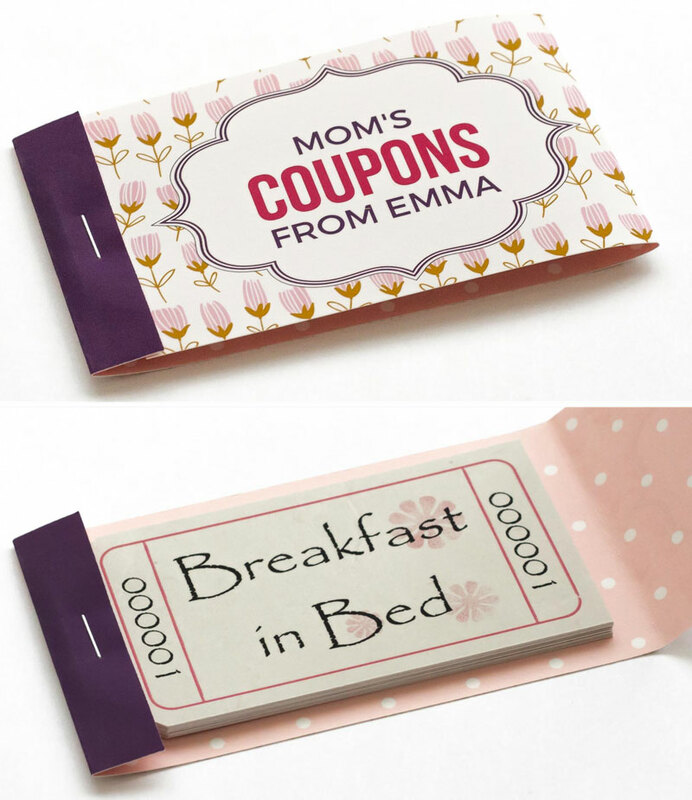 "My son couldn't wait to see the smile on his Mom's face..."
The coupons turned out very well, as if you'd bought them premade from a shop. And they were easy to put together - so easy in fact that my 7 year old son did it! It was satisfying for him, like "yeah I know I printed it, but I still had to *make* it" (my children are quite craft-oriented.) And my kids liked the fact that they could personalize them. I'd looked around at a few other sites but I didn't find any where you could change the text or the cover. My kids mostly used the messages that you'd suggested but they also came up with some new ones. My son put in one "buy some clothes" and folded up some money and put it in the booklet as a surprise for his mum to go out and buy some dresses. He couldn't wait to see the smile on her face! My kids also put in one coupon "tidy your room", which has turned tidying their room into a bit of fun! 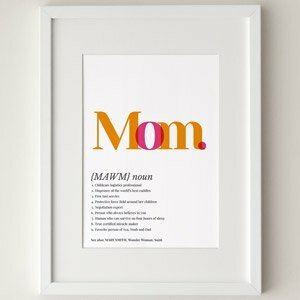 A little tip: I printed the Mothers Day coupons onto artist's "cartridge paper" which is somewhere in between normal paper and card stock. It worked perfectly and gave the coupons and cover a good stiffness, and also a bit of mottled effect and texture so they look like proper tickets. " "Almost like they were made professionally..."
I bought your coupons for my kids to give to my wife. I wasn't sure how they'd turn out, and I was afraid they might look a bit amateurish, but using your template they turned out really nicely, almost like they were made professionally. I printed them on some "presentation white card" and they came out great, and only took about 5 minutes to put together. What I liked best was the way that you could personalize the coupons and the cover, but at the same time they looked so nice you'd think they were bought in a shop. To be honest I wasn't really looking to spend any money when I found your site. 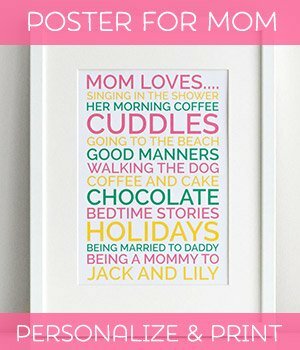 I was just googling for "free mother's day voucher templates" or something like that. But when I saw your mothers day coupons I could see they would probably look really nice. Besides, they only cost about the same as what I would have spent on cards anyway so I thought "let's go for it!". They came in really handy actually because at first I was thinking we'd by my wife a beauty treatment, but then I didn't know which store to choose. Using your coupons, the kids and I could give my wife a voucher and let her choose what she wants herself, which was great. Got a story of your own to share? 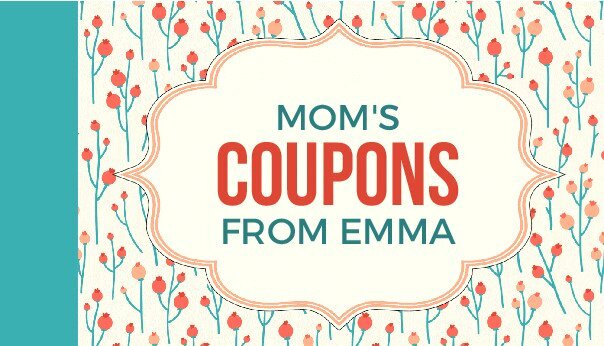 Tell me about your experience with the Mothers Day Coupons... you can contact me with this handy form . 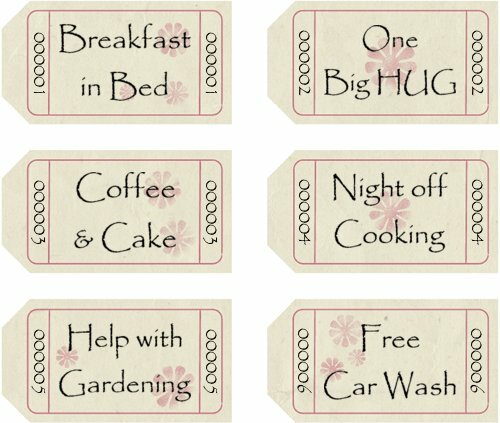 How do I assemble the coupons? Please see the detailed assembly instructions . It's really easy - all you need is scissors and stapler. What sort of printer do I need? What sort of paper should I use? Regular printer paper works fine. For the covers, you may wish to use a slightly stiffer paper, e.g. a matte photo paper, but this is optional. 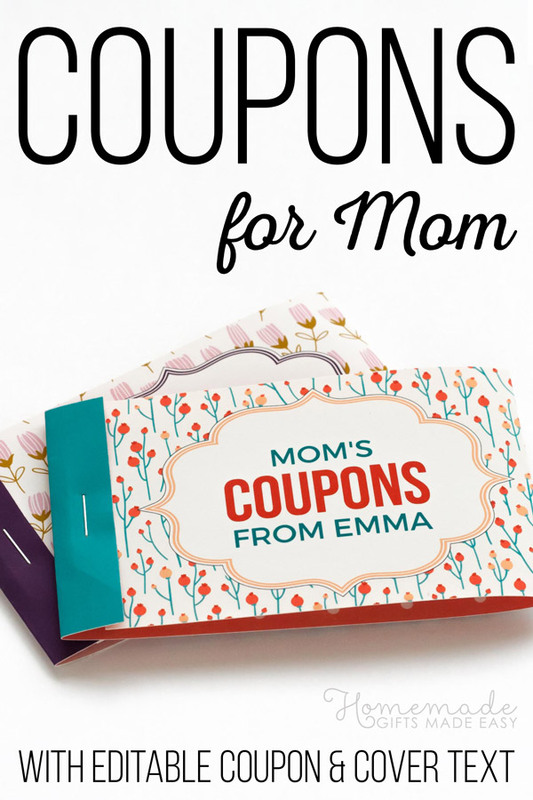 Do I need to pay separately for the coupons and the covers? How big are the coupons? The coupon booklet is 4.6 x 2.5 inches - about the size of an iPhone. What resolution are the coupons? We want your coupons to look beautiful when they're printed so the coupon maker creates high resolution 300 dpi images - finer than your eye can see!